Step 1. 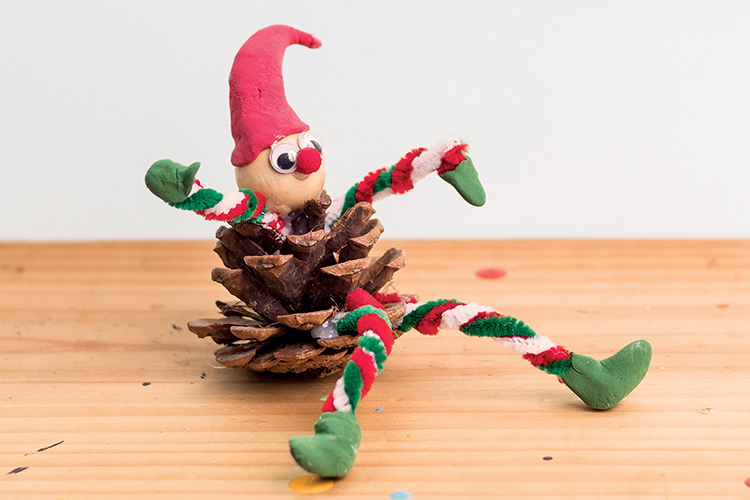 Use a large pine cone for the elf’s body. Step 2. Take three 30cm chenille stems, in assorted colours and twist together. Cut lengths in half, and then in half again. You should now have four twisted lengths. Step 3. Poke and position two of the stem pieces in the lower part of the cone to create the elf’s legs. Secure with hot melt glue. Take the remaining two pieces, position in the upper half of the cone to create arms, then glue in place. Step 4. Use a round wooden bead for the elf’s head and glue to secure. Step 5. Add features to the elf’s head and body: glue on joggle eyes and add a pom pom for a nose. Model a Magiclay hat, boots and mittens to complete.